Components are the building blocks of Angular applications. 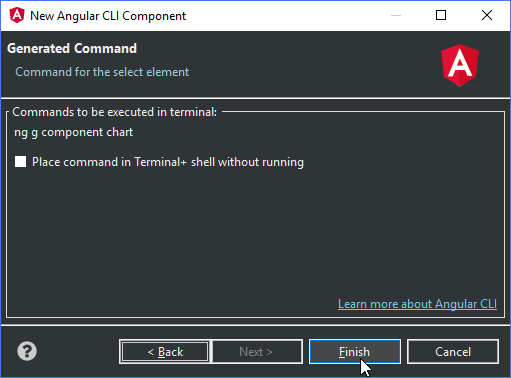 The New Angular CLI Component wizard in the Angular IDE provides a quick way to create components. This wizard is available in our Angular IDE, Webclipse Eclipse plugin and MyEclipse Java EE IDE. Before diving in to make a component, it is worthwhile to understand what a component is. At its most basic form, it is the encapsulation of a User Interface component including the controller and the interface elements. An Angular component can be a page on a dashboard using a bunch of sub-components, or something as small as a custom widget for dropping down a list of items. For instance, this example shows making a drop-down calendar with particular controls. Think of it like any other input form control in that it is going to render the UI and provide the backing logic. This HTML snippet inside an Angular component template file allows a property as an input, in this case “options” and emits an output event, in this case for selection events. Inside the TypeScript file, the similar elements are going to be defined. Inside the file, the @Component designation describes the inputs that the dd-calendar widget supports. The Angular team has made significant strides to ensure users follow best practices with the framework. To that end, they created a CLI for Angular, run as ng on the command line. The ng command allows generation of components as well as other important steps like running a server. 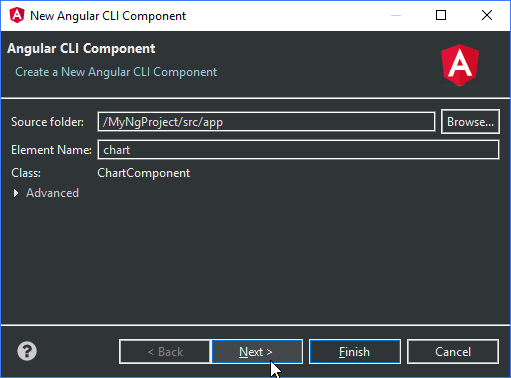 Inside the Angular IDE tooling, select File>New>Component (or use the New button or context menu) to access the New Angular CLI Component wizard. The wizard provides a way to learn the capabilities of the CLI as well as simplify adding new components. Inside the Angular Component wizard, specify the Name of the component and optionally the paths to the location where the component will be generated. An important note about components is that there is a particular convention that should be followed. Filenames are lowercase like my-calendar.component.ts which would have a TypeScript class named MyCalendarComponent. Note that the component suffix is automatically added by the generator. The wizard inside the Angular IDE will automatically provide context on this as component names are filled in. In the my-angular example, three files are automatically generated. my-angular.component.ts—Contains the TypeScript class declaration for the component. my-angular.component.html—Contains the HTML structure of the component. my-angular.component.css—Contains any extra styling to be used when rendering the component. Next up, start using the component’s element declaration in other areas of the application then head on over to the Run and Debug area in the Learning Center to start up your server and see your app in action.